Sateraito Office My Portal Gadgets for Google Apps helps you to build portal site for your organization by providing suite of gadgets to add to Google Site. 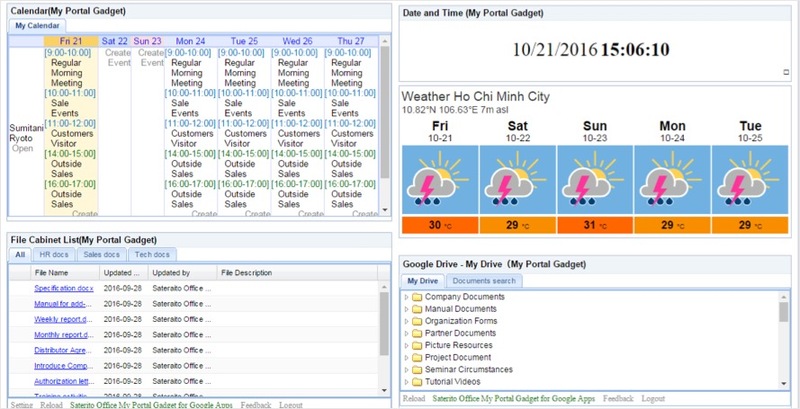 Announcement gadget, calendar gadget, gmail gadget, drive gadget, site list gadget and many more other gadgets to harvest all information in your Google Apps environment and place these inforamtion on your portal site. ・Provide suite of gadgets to help you build portal site in Google Site. →harvest information from Google Announcement sites. One gadget can list all inforamtions from all Google Announcement sites. →You can add other calendars to keep track multiple calendars. →List all files uploaded to all Google Cabinet Sites. →List all your accessible Google Sites. →List your Google drive, provide search feature to search your google drive. →Help you to inject other website to your portal site.